PYROPHONE JUGGERNAUT – A fire and music spectacular! A fire and music spectacular! Please click on image below to view larger size, or for more images go to our gallery. The Pyrophone in its original form at the Mitchell Fire and Water Festival 2005. Based on a 250 year old experimental musical instrument, Hubbub Music’s Pyrophone Juggernaut is the largest hand operated multi octave fire organ in the world. Deep growls, atavistic moans and even coral sounding timbres combine with epic bell cords, industrial drums and acoustic thongaphone bass. 3 Giant flame instruments (spanning 12 metres long x 9 metres high), made from stainless steel, copper and aluminium create unearthly music in concert. 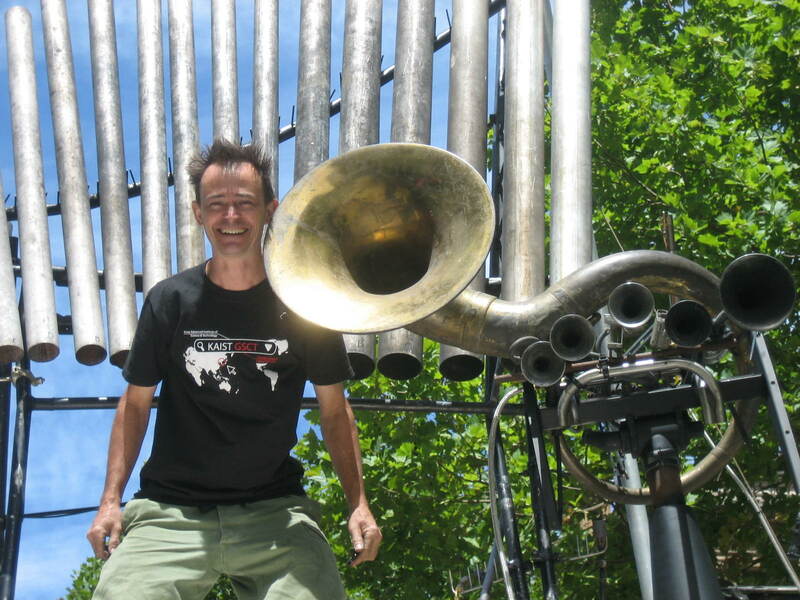 Perched on top of a shipping container and designed to set sail, the fire organ is accompanied by massive, tuned freight liner alloy wheels, sub-frequency metallophones, fire infused truck horns and a giant gong. The flow from a combustion venturi (in our case, a hand-held trigger-regulated propane torch) excites the standing wave of a length of tube – a pressure wave that travels to the end of the tube and partially reflects back, as in an open-ended organ pipe. This resonates the fundamental pitch of the length of pipe. It has been discovered a number of variables can affect the timbre and pitch of the sounds, such as size, pressure and depth of penetration of the flame source and fluctuations of air temperature. Frequencies produced can double or halve, and under- or over-blowing can accentuate the different harmonics of each flame tube. Steve Langton grew up in India where early impressions of street festivals, music, and architecture conspired to influence his present craft and fascination with happy chaos, rhythmic music and elegance in form. The modern demand for musically interactive public sculpture and spectacular theatre are the engines that drive the huge range of projects Steve has undertaken. He lives for true musical “play”, community music and people making music with freely available musical instruments, built rugged, looking elegant and sounding enticingly funky. Steve Langton accepting an award of appreciation from the director of the Taiwan Arts Centre.